George William (Will) Morgan was William Thomas and Sarah Lovina Ross Morgan's oldest son. Above is a fine portrait of George William Morgan. George William was so handsome that his family sometimes called him the Gary Cooper of the Morgan family. Below is an early family picture with his wife Emily and their oldest four children. Grandpa G. W. (Will) Morgan was the first white child born at Neeley, Idaho on Christmas Eve, 1881, soon after the family arrived there from Utah. 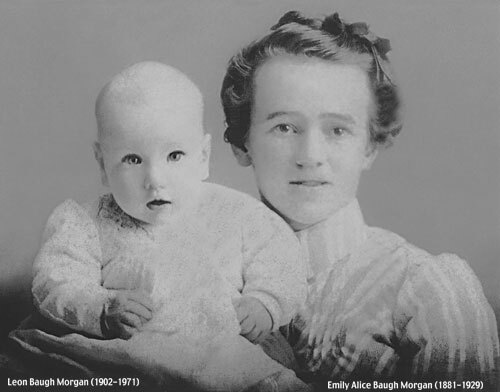 Below is a portrait of his wife Emily Alice Baugh Morgan and their first child Leon. George William was commonly called Will. Members of his family sometimes call him G W.
She married George William Morgan on 24 April 1901 in the Logan, Utah Temple. Emily's father was: Briar Baugh, born 12 October 1833 in Old Park, Shropshire, England. He died 21 October 1907, Bensen Ward, Cache County, Utah. Emily's mother was: Mary Ann Anderson (Adopted name). She was born 22 November 1842 in Vensyssel, Skallerup, Hjrrng (Denmark). She died 24 October 1924 at Wellsville, Cache, Utah. She married Briar Baugh on 13 January 1865. Click on the link above to see a picture of Emily's mother and Emily's sister. 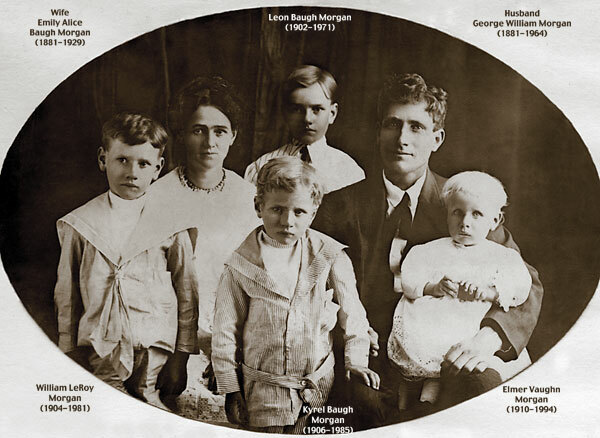 Leon Baugh Morgan, born 16 April 1902 in Neeley, Power, Idaho, and died 16 August 1971 in Nampa, Canyon, Idaho. He married Mamie Dell Richardson on 28 September 1921 in the Logan, Utah, LDS temple. She was born 28 December 1902 in Fairview, Lincoln, Wyoming, daughter of Levi Asa Richardson and Polly Erminnie Child. They had a family in and near American Falls, Power, Idaho. She died 6 January 2002 in Boise, Ada, Idaho. 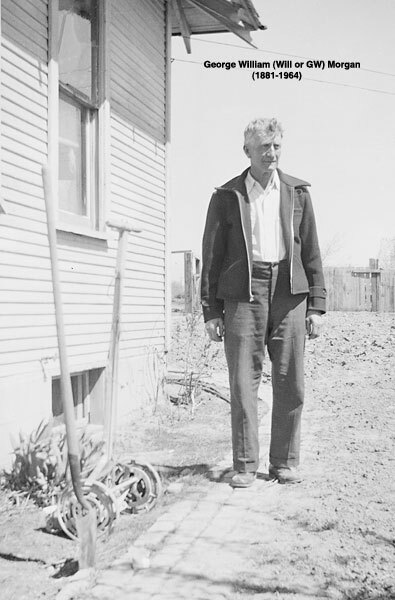 William LeRoy (Roy) Morgan was born 24 April 1904 in Neeley, Power, Idaho, and died 23 July 1981 in Boise, Ada, Idaho. He never married. Kyrel Baugh (Pete) Morgan was born 29 July 1906 in American Falls, Power. Idaho, and died 10 September 1985 in Middleton, Canyon, Idaho. He married 19 May 1928 to Velma May Lee, born 14 October 1911 and died 22 September 1981 in Caldwell, Canyon, Idaho. Elmer Vaughn Morgan (aka Vaughn), born 14 November 1910 in Neeley, Power, Idaho, and died 1 October 1994 in American Falls, Power, Idaho. 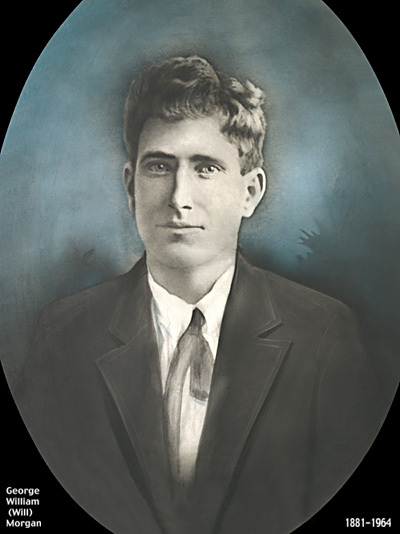 He married 15 September 1929 in Pocatello, Bannock, Idaho, to Ilah Fifield, born 11 January 1913 in Rockland, Power, Idaho, daughter of William P Fifield and Amorette Allen. Ilah died 23 november 2001 in Blackfoot, Bingham, Idaho. They lived in American Falls and Rockland, Idaho. Francis Merl Morgan (Twin), born 30 December 1916 in Neeley, Power, Idaho, and died 27 February 2003 in Emmett, Gem, Idaho. He married Billie Dean Adams 10 August 1950, born about 1927, probably in Palisade, Bonneville, Idaho. Chester Earl Morgan (Twin), born 30 December 1916 in Neeley, Power, Idaho, and died 16 February 1999 in Middleton, Canyon County, Idaho at the home of his daughter Janet. He married 2 December 1947 to Verna Alleene Montague, daughter of Glenn Montague and Ada Verna Morgan Radford. Wilma Blanche Morgan, born 24 November 1921 at American Falls, Power, Idaho. She married Robert Grounds 29 November 1945. Click on the link above to see a picture of Wilma Morgan and her husband Robert Grounds. Click on the link above to read a George William Morgan life history by Lon Morgan. Click on the link above to see more pictures of the George William and Emily Morgan family.